Everyone knows that San Francisco is home of the Golden Gate bridge, but there are so many more things to do in the city! 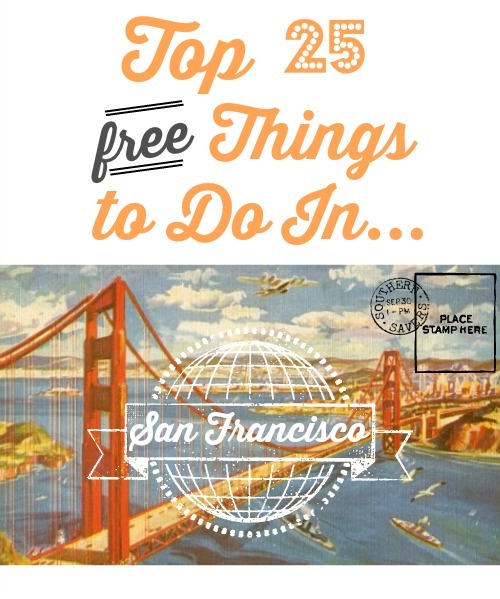 Here are 25 FREE things to do in San Francisco. A nice stroll or bike ride across Golden Gate Bridge is another way to enjoy the landmark. The East sidewalk (the one facing San Francisco Bay and Alcatraz) is open to bikers and pedestrians. If you’re walking, make sure you check the operating schedule before you show up. After many families settled in San Francisco from the Gold Rush, Fort Point was planned to protect them from enemies. It wasn’t until the Civil War that it was completed and actively guarded from the Confederate army (which never attacked). Many Hitchcock fans flock to this site as it was used in a scene from one of his films. Not only is it a great piece of history, but it’s worth a visit if only for the views it offers of the Golden Gate Bridge. Much like New York’s Central Park, but a bit more eccentric. It’s 1,017 acres large and about 3 miles long. Some of the features in the Golden Gate Park include a Japanese Tea Garden, Conservatory or Flowers, botanical garden, windmills and a carousel. It also is featured in a number of films including scenes from Charlie Chaplin films, The Pursuit of Happyness, Star Trek IV and more. I don’t know about you, but we don’t see many sea lions where I’m from. Especially not in masses. Sea Lions began showing up in January of 1990 and you can see as many as 900 each winter. They usually migrate south during the summer months, but a small group has been sticking around K-Dock in recent years. Yep, you can learn juggling and tightrope walking every Friday in San Francisco from 7-9 pm. Make sure you show up by 6:45 to get a spot in the class. Whether this is your first time practicing the skill or you’ve tried it before, everyone of all skill levels over the age of 8 are welcome. Learning about the Wave Organ seriously made me want to visit San Francisco. It’s such a thoughtful idea and something that my kids would enjoy. It’s an acoustic sculpture on the shore of the bay made with stone from the demolition of Laurel Hill Cemetery in San Francisco. There are several different station that convey different sounds that the waves make through a series of pipes. The Presidio was first an Army base. It now has museums and food trucks, restaurants and recreational destinations, art installations, trails, and the best views of the Golden Gate in San Francisco. Be sure to check out any free events that may be happening! City Hall is not only the location of Harvey Milk’s Assassination in 1978, but it has lots of fun historical artifacts as well. They offer free tours that are approximately one hour in length. If someone in your family is interested in old arcade games or interesting coin attractions, make sure you stop by Musée Mechanique. If your kids are easily spooked, think twice before you take them. Some of the old mannequins on display look pretty unique. Admission is free, but make sure you bring a supply of coins so you can actually play the games. Walking tours of the murals are on Wednesdays and Saturdays. Check their calendar for exact times. These murals were created by some of the leading artists of the 1930’s depicting The Great Depression, landscapes, city life and more. If you take the tour rather than going on your own, you may see some murals that aren’t even open to the public. The city views from Coit Tower are worth the trip on their own. Whether you want to see the Japanese Tea Gardens, Gold Rush City, Chinatown, or pretty much any other area of the city, check for free walking tours. The tours are 1-1 1/2 hours long and are led by someone who knows what they’re talking about. I’d say that this is the way to go if you love tour and learning the history of places without paying a bundle. The founder of the museum had hopes for “a place that would foster a love of science, natural history, and the arts.” The museum strives to inspire creativity, curiosity and appreciation for the world around us. Admission to the Randall Museum is free, but you may need to pay for hands-on classes that you take. This community project is a sight to see. A beautiful mosaic covers the risers of 163 steps at 16th and Moraga. Travel a couple of blocks down to see the new steps that have just been opened. Bring the joys of books and book making to your family first hand. They offer 300 workshops every year to learners of all levels. The Center for the Book offers free public programs include opening receptions for the exhibition program, poetry readings, book release parties for our publications, gallery talks, Open Houses and other community events like the annual Earth Day Extravaganza and Roadworks Street Fair. If you’re in town with a car and you want a great view of the city and some photo opps, drive up to Twin Peaks. Free parking, bathrooms available, and great views. What more could you ask for? The San Francisco Chamber Orchestra is dedicated to making classical music available to everyone – no matter their age or background. This program is pretty great. They have Main Stage Concerts, Family Concerts and Very First Concerts. The Very First Concerts are mini-presentations designed to teach musical concepts, offer hands-on experiences, plus they encourage lots of dancing! Check under “Concerts and Events” to see what’s available while you’re in town. Tour 8 historic vessels, the oldest of them being from 1886! It’s a great opportunity for anyone interested in history or boats. But really, even if you hate both of those things, these are a sight to see. National parks offer free admission on certain days of the year. The Maritime National Historic Park is a national park, so check out which days offer free admission to visitors. When you think about San Francisco, the first two things you think about are probably the Golden Gate Bridge and Cable Cars. The Cable Car Museum is the perfect way to get up close with this city’s trademark transportation. The museum is located in the cable car barn and powerhouse and overlooks the huge engines and winding wheels that pull the cables. Downstairs is a viewing area of the large sheaves and cable line entering the building through the channel under the street. Plus, see antique cable cars and plenty of photos! The de Young Museum is free on first Tuesdays. The museum is one of the features in the Golden Gate Park and integrates art, architecture and the natural landscape in one multi-faceted destination. The exhibits include collections of American art from the 17th through the 20th centuries, Textile arts, and art of Africa, Oceania, and the Americas. This fine art museum has some beautiful exhibits. It includes a number of Rodin sculptures and a rotating list of world renowned artists. The building itself is modeled after the Palais de la Légion d’Honneur in Paris and is dedicated to the California soldiers who died on the battlefield of France during WWI. Visit for free on the first Tuesday of every month. Head over to the Bay Bridge at sunset or just find a vantage point where you can see it. Watch the lights of the bridge turn on. This is the world’s largest LED sculpture with 250,000 white LED lights. The bridge displays a never-repeating show that is powered until March 2015. Right now they’re trying to raise money to keep the project going until 2026. Every Wednesday you can take a free General Information lesson on lawn bowling. Once you’ve learned how to play, enjoy a game on one of the three courses within the Golden Gate Park or just watch a game! Visit Ghirardelli Chocolate Manufactory & Soda Fountain and Ghirardelli Square which is considered to be the first successful adaptive reuse project in the country. Not only are there unique shops in the square, but you can try out some free chocolate samples. Lindy in the Park is the longest running swing “venue” in the bay area. It’s open to dancers of all ages and skill level – you don’t even need an experienced partner. The party is every Sunday from 11am-2pm (unless it’s raining). Free beginner swing dance lessons start at noon. This “mini park” all began in 1963 when a neighborhood came together and petitioned for their last open space not to be turned into another apartment building. The result was a fun and quirky park that goes to show what can happen when individuals pull together for a common goal. 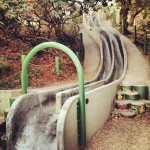 These cement slides look like such fun. Pick up some cardboard from the bottom of the slides or on your way to the park and have a go at it.